Yes, I know Aretha Franklin also did a song called ‘I Never Loved A Man (The Way I Love You)’, but hers is a breathy, soulful song written by Ronnie Shannon. Margaret Singana’s is a completely different song, written by John Russell and produced by Patric van Blerk, Trevor Rabin and Julian Laxton. And with that production team, you know you’re going to have a great song. 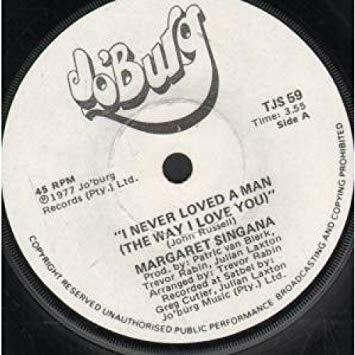 ‘I Never Loved A Man’ (Margaret’s one) was first seen, as far as I can tell, in 1977 when it was released as a single and included on her ‘Tribal Fence’ album. It has an early disco bounce to it that would have enticed most on to the dancefloor back then for a little boogie. It’s got a funky bass, a thumping beat interwoven with some 70’s rock guitar. All of this underpins Margaret’s strong vocals. The song made it on to the Springbok Top 20 where it managed 18 weeks, spending 3 frustrating weeks at 3 while Heart’s ‘Barracuda’ and McCully Workshop’s ‘Buccaneer’ battled it out for the top 2 spots, then eventually made it to number 2 for a week on 13 January 1978, but was denied the top spot by ‘Barracuda’. This would be her most successful effort on our charts and also the best performance for the 3 producers with the exception of van Blerk who eventually saw a number 1 hit as producer with Joy’s ‘Paradise Road’. I guess one could say that We never loved a song (produced by Patric van Blerk, Trevor Rabin and Julian Laxton) the way we loved Margaret’s ‘I Never Loved A Man’. ‘Paradise Road’ became a South African classic that still reverberates around the local music world to this day. But before Joy brought us that chart topping hit, they had a lesser know song make number 11, about 6 months before ‘Paradise Road’ cracked the charts and that was ‘Ain’t Gonna Stop Till I Get To The Top’. Like ‘Paradise Road’, ‘Ain’t Gonna Stop…’ was written by Fransua Roos and Patric van Blerk and both tracks appeared on the album called ‘Paradise Road’. 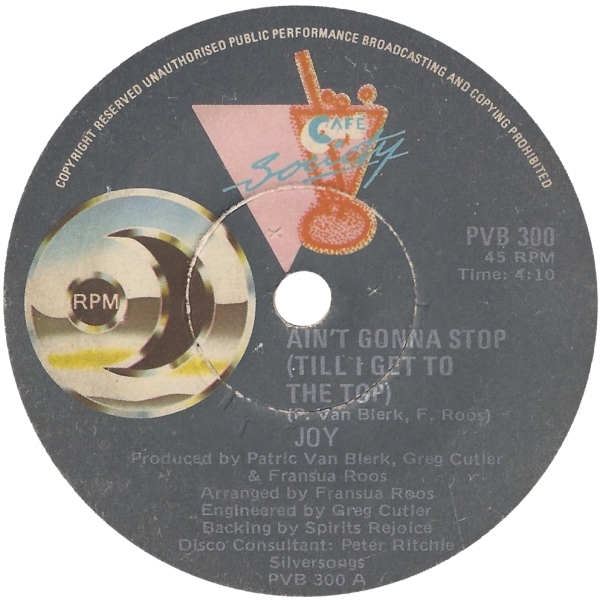 However, unlike the soulful chart topper, ‘Ain’t Gonna Stop’ is a straight on disco floorfiller. From the moment the funky bass starts up (about 3 seconds into the song), you know that you are going to be dancing to this one and that is soon confirmed as that disco beat (you know the one I’m talking about) hits in. And while that is strutting around your turntable (remember those? ), you are hit with a voice that is not too distant to that of one of the greats of the disco era, Donna Summer. Interestingly, 2 years after ‘Ain’t Gonna Stop’ was released in 1980, Joy covered the Jon & Vangelis song ‘State Of Independence’ around the same time that Donna Summer released her own cover. Co-incidence? Well listen to ‘Ain’t gonna Stop’ and I think you’ll agree that Joy knew how to do disco the same way Donna Summer did. Joy actually did not stop once they managed to get to the top because apart from the cover of ‘State Of Independence’ mentioned above they had one more song make the Springbok charts, but that’s for another entry on this blog. Thunder rolls across a menacing sky, but the storm does not come. The clouds suddenly disappate and the sun begins to pulse over the land again. But it is a harsh sun that bakes the country in its unrelenting heat. That is how the start of ‘Saint Judas’ feels. There is a blast of guitar and keyboard at the start of the song that sound ominous. But this fades and a thumping beat begins with Ramsay’s growled Scottish vocals bellowing at you. Then, into this harsh heat come a cool breeze in the form of a beautiful violin riff (are violins allowed riffs?) and some shady sax interludes which prevent the song from being just a howling growling stompathon. The heavy syncopation is offset perfectly by the tuneful sax and violins, creating a song dense in sound, yet strangely refreshing. 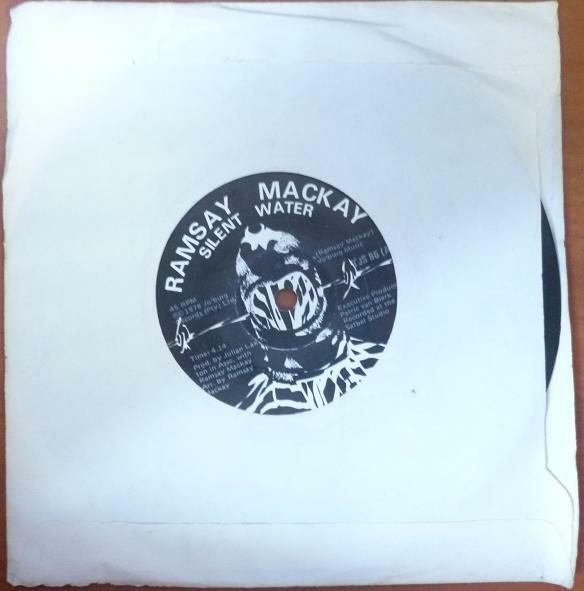 ‘Saint Judas’ was actually the b-side of Ramsay’s single ‘Silent Water’ (which was also released in Spanish as ‘Agua Silenciosa’) and was the opening track on his album ‘The Suburbs Of Ur’. 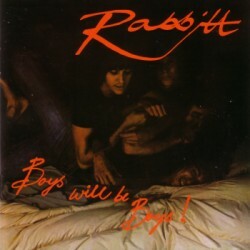 It features Rabbitt’s Ronnie Robot on bass and was produced by Julian Laxton and Patric van Blerk. With names like this helping out Ramsay (who was in Freedom’s Children remember) it is not surprising that this song could be included in this list. years back (either that or from their parents playing it). a firm favourite of many South Africans for many years to come.